Over the weekend, many different outlets shared views of the September 11 tragedy. Artists have also expressed their feelings over the years and Googling for artist 9/11 tributes will return thousands of works. It is intriguing to see how artists work their feelings about this tragey in their work. Below are a only few that caught my eye. Tar Baby vs St. Sebastien - This is not a tribute to the 9/11 attack, but a tribute to the Tuskegee Airmen. 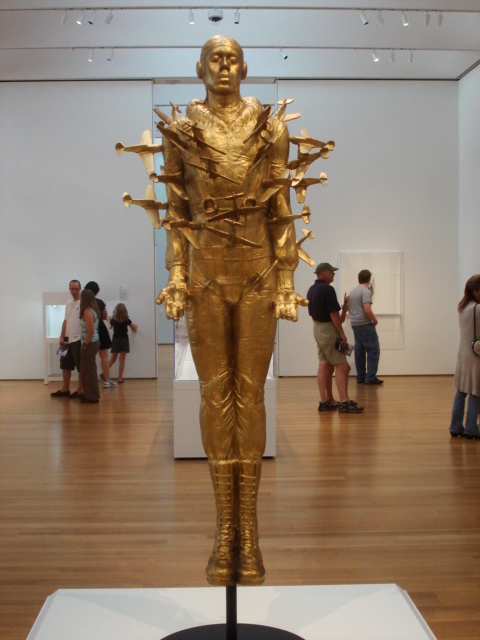 Artist Michael Richards completed this sculpture in 1999 before his death in the World Trade Center; his office was in the 92nd Floor of the north tower. Lady Liberty - It is uncertain how the fiberglass statue suddenly appeared outside the firehouse, but its arrival soon encouraged Lady Liberty's ongoing, spontaneous ornamentation with messages and tributes left by the public.